Thanks to generous donors, patients not previously candidates for traditional surgical procedures can now access life-saving treatment in Virginia Mason’s hybrid operating room. 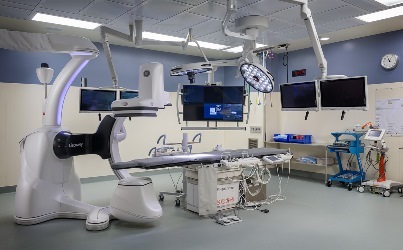 It was designed by providers, nurses, and technicians from vascular surgery, cardiology, cardiothoracic surgery, interventional radiology and anesthesiology. A surgical environment that enables less invasive procedures results in improved outcomes and safer care. High precision imaging shows patient scans, records and diagnostics, as well as 3D graphics. “Enhanced visualization improves communication and is a win-win for the patient,” says Carli Hoaglan, MD. Advanced imaging enables another breakthrough technique not previously performed at Virginia Mason: transcatheter aortic valve replacement (TAVR). “TAVR is a less invasive procedure not requiring open heart surgery,” says cardiologist Wayne Hwang, MD. Benefits include shorter hospital stays and faster recovery. Dr. Hwang recently had a 94-year-old patient walking the next day and discharged after two days. We are grateful for our donors who make innovative treatment possible!